Mens knee sock with graduated compression and massaging sole. Fine cotton at skin contact. Comfortable and soft elastic knee hem. Massaging sole that helps plantars microcirculation and foot perspiration. Elegant and exclusive lateral design. Reinforced and anatomical heel and toe. Available in compression 20-30 mmHg (medium). 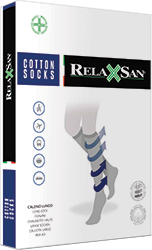 RelaxSan Cotton Socks items, thanks to their graduated compression, improve blood circulation and are recommended for those people who make sedentary activities and travel frequently. 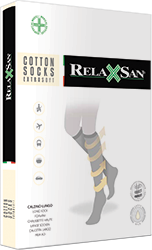 Compression recommended for the therapy of the light chronic venous insufficiency, varicose veins and swelling. * The compression recommended refers to ankle, and then decreases gradually. Unisex Cotton knee socks with graduated compression. Fine Cotton at skin contact, soft and comfortable elastic knee hem. Unisex Milk fiber sock. 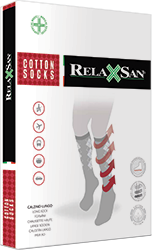 Viscose and Milk fiber make the skin soft and silky and maintains the foot stays fresh and dry. Cotton and Silver fiber Mens knee sock. Silver fiber at skin contact provides an antibacterial and antistatic function. Mens knee sock with massaging sole that helps plantars microcirculation and foot perspiration. Fine cotton at skin contact.